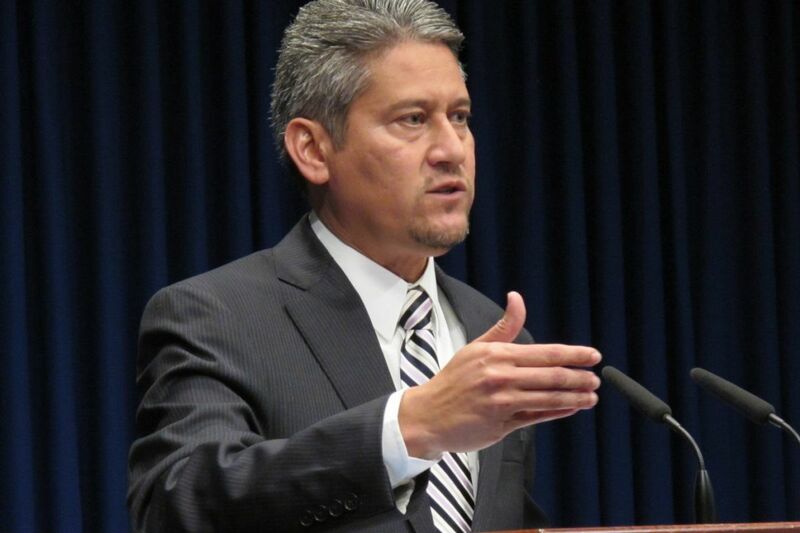 Pedro Cortes, Pennsylvania's secretary of state, abruptly resigned from office Wednesday, three weeks after his agency came under criticism for a glitch that may have allowed thousands of ineligible immigrants statewide to vote. Cortes' departure was announced in a 349-word "personnel update" emailed from Gov. Wolf's office that offered no reason and focused almost entirely on his replacement, interim Secretary of State Robert Torres. Just 14 of the words were about Cortes, a Democrat who also served as secretary of state from 2003 to 2010 under Gov. Ed Rendell. J.J. Abbott, a spokesman for Wolf, said he could not offer an explanation for Cortes' departure. As secretary of state, Cortes served as the state's top election official. His departure comes a week after State Rep. Daryl Metcalfe, chairman of the House State Government Committee, and 15 of his colleagues sent Cortes a letter "to express our dire concerns" about the disclosure three weeks ago that legal resident noncitizens in Pennsylvania had been offered the chance to register to vote while applying for or renewing drivers' licenses at PennDot service centers. Metcalfe, a Butler County Republican who has been preparing to hold a hearing on the issue before the Nov. 7 general election, said he received a phone call from the governor's office Wednesday to inform him Cortes was stepping down. He said he and his colleagues are still waiting on an answer to their questions in last week's letter. "I'm not sure why [Cortes resigned] or what's going on, but we're hopeful to get answers to very important questions," Metcalfe said. "We were hoping to hold [the hearing] to get answers to questions that are important to Pennsylvania voters about how these foreign nationals have gotten onto the voter rolls." "Cortes knew this was an issue," Metcalfe said. "It is interesting that his resignation occurred within a week of our letter to him about this serious issue." Schmidt's office found documentation from 220, either through direct contact or via an attorney, canceling the voter registrations. Of those 220, 44 voted in one election and 46 voted in more than one election. All of the 317 registrations have been canceled. Schmidt said his staff traced the problem for 168 of the 220 documented cases to PennDot centers, where they produced immigration documents to show they were in this country legally and eligible for a driver's license. Later in the process, the applicants were asked to check a box on an electronic kiosk if they also wanted to register to vote. That is part of "Motor Voter," a federal law passed that has been in effect since 1995 to encourage voter registration. And Wolf's office noted that the "glitch has existed for decades, through Republican and Democratic administrations," and Wolf's staff "is actually taking action to fix it."